Welcome to Dog Song Saturday at Talking Dogs! Every Saturday we share music videos with songs about dogs. Many of them are original songs like our song today. Dog Song by Doug McFarland is all about dogs and their people. And the organizations that help dogs. as many as they possibly can. McFarland notes: No cats were included in the filming of this video. 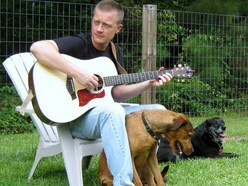 Musician and songwriter, McFarland lives in North Carolina where he plays with dogs and composes music. If you like this song you might want to have him create a custom song for you. Fetch www.yourpersonalsongwriter.com and get in touch with him. Sit. Stay. Relax and enjoy Dog Song by The Doug McFarland One. Fetch more dog songs and music videos at Talking Dogs. You'll be surprised at how many we've collected over the years.